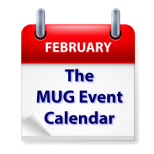 Some of the topics on this week’s MUG Event Calendar include word processing with Pages, how to use parental controls, and the joy of Vintage Macs. A California creative pro group will discuss color correction in video, a Virginia group will hold a massive question and answer session, and a Florida group will focus on Mac fundamentals. Apple Pie User Group of Southeast Michigan – "Lloyd’s Leads & Bargains"
MACtreff Dusseldorf (Germany) – Muß ich auf das neue OSX umsteigen? Los Angeles Creative Pro Users Group – "Color Me" Night. Join us as we welcome from Light Iron Post in Hollywood, Christian Ellis. Christian is the Senior Episodic (DI) Producer at Light Iron. Plus a demo of Color Finale by Caitlyn Cutler. Plus Working with Color and Adobe Premiere Pro with Karl Soule. It’s a rainbow of colors night.